OLYMPIA, Wash.— The Washington Department of Fish and Wildlife has indicated it plans to kill the entire Profanity Peak wolf pack over conflicts with livestock on national forest lands in northern Ferry County. This is the second time in four years that an entire pack of endangered wolves has been slated for death due to the grazing of privately owned cattle on publicly owned lands. Washington currently has a confirmed population of 90 wolves, and killing the Profanity Peak pack, which consists of 11 known wolves, would result in the eradication of 12 percent of the state’s endangered wolf population. 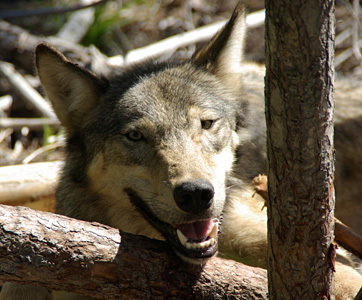 Diamond pack female wolf courtesy Washington Department of Fish and Wildlife. Photos are available for media use. At least two of the pack’s wolves, including the breeding female, have already been killed as part of this operation. In 2012 another entire wolf pack, the Wedge pack, was the target of an agency kill order near where the Profanity Peak pack now ranges, for conflicts with livestock owned by one of the same ranchers as in this instance, on both public and private lands. Aiming to kill the entire pack, state officials succeeded in killing six of the pack’s eight members. If the Profanity Peak pack is eradicated, this will bring to 17 the number of state-protected endangered wolves killed on behalf of one of the two livestock operators grazing in the pack’s territory in the Colville National Forest. Washington’s wolves were driven to extinction in the early 1900s by a government-sponsored eradication program on behalf of the livestock industry. Since the early 2000s, the animals have started to make a slow comeback by dispersing into Washington from neighboring Idaho and British Columbia. But wolf recovery is still in its infancy, with only an estimated 90 wolves at the end of 2015. In 2012 nearly the entire Wedge pack was killed over livestock conflicts that occurred partly on federal public land, and in 2014 the agency sought to kill members of the Huckleberry pack — and did kill the pack’s breeding female — over livestock conflicts that occurred partly on state-owned lands. The Profanity Peak pack, first confirmed as a pack in 2014, ranges across territory that includes multiple public lands grazing allotments in northern Ferry County. Under Washington’s wolf plan, livestock owners who have had wolf-caused losses are eligible for taxpayer-funded compensation, and, as is the case here, are eligible for double compensation when the livestock were grazing on areas of 100 or more acres. Taxpayers have also funded the radio collars placed on pack members to help the agency with the species’ recovery, which have now been used to locate and kill the pack’s members. This practice is commonly referred to as the use of “Judas wolves” because the collared wolves unknowingly betray the location of their family members, who are then killed. The Kettle Range Conservation Group seeks to defend wilderness, protect biodiversity and restore ecosystems of the Columbia River Basin. The Lands Council preserves and revitalizes Inland Northwest forests, water and wildlife through advocacy, education, effective action and community engagement. The Endangered Species Coalition is a national network of hundreds of organizations and more than 175,000 activists working to protect imperiled species.